“Master yoga instructor, Wayne Mateski, cautions against taking his classes too seriously. ‘It’s just yoga class, you’re supposed to have fun’ he says. Energy owner, Debra Tourek says, ‘There should be a place in your life where you do something for yourself, which in turn benefits those around you’." 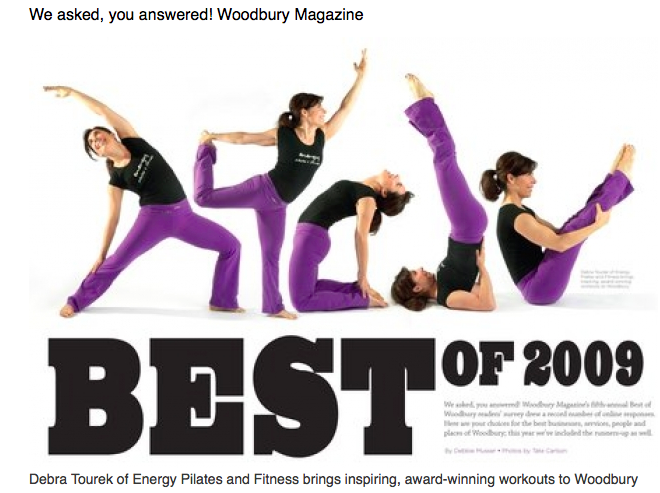 "A well-known name on the Woodbury fitness scene for about 15 years, Debra Tourek opened Energy in March 2008, offering a variety of functional, full-body workouts including Pilates, yoga, kickboxing, and even barefoot cardio. Tourek’s goal: that each client walk out the door feeling good about themselves instead of focusing on what their body looks like. ‘After working out with Debra for a few months, what strikes me the most is how she respects everyone on the same level, no matter what their level,’ says a current client.”re to edit.